The UF COE co-hosted its 2nd Social Justice Summit: For the Gator Good on Jan. 26-27 on campus. The summit brought together scholars and experts from multiple disciplines, members and advocates of marginalized groups, and other concerned individuals from the university and community to discuss priorities and set aggressive action strategies for eradicating social and racial injustices and biases in the greater Gainesville area. 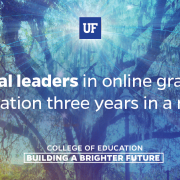 UF College of Education online programs ranked best in state, No. 2 in U.S. The College of Education at the University of Florida continues to stake claim as the state’s best online graduate degree program in education and rates second best in the nation, according to the annual rankings released today (Jan. 9) by U.S. News and World Report magazine. https://education.ufl.edu/etc/files/2018/01/UF_COE_Online_Rankings_2018.png 628 1200 kevincoulson https://education.ufl.edu/student-services/files/2016/09/headerblue.png kevincoulson2018-01-09 04:15:082019-01-14 20:31:38UF College of Education online programs ranked best in state, No. 2 in U.S.